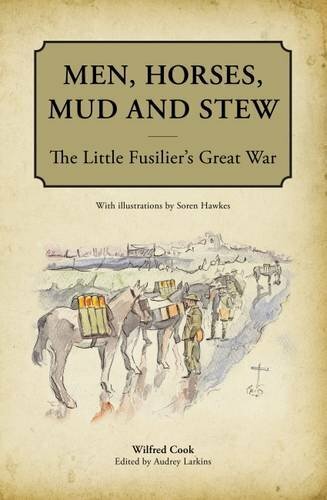 Men, Horses, Mud and Stew is, as the name suggests, the story of one man’s experiences in the Great War which started, for him, at the age of 18. The memoir logs the protagonist’s time, from enlistment and training at Whitley Bay to his service in the trenches of the Western Front. The book itself is an incredibly pleasant book to look at and own. The design is really aesthetically pleasing and really suits the style of the contents. At the start of each chapter is a beautiful, coloured illustration detailing one aspect or thing contained in the chapter. These illustrations were done by British artist (Ypres based) Soren Hawkes and, again, the minimalist style of the artwork fits perfectly with the style of the book which is simply one of the millions of men who had experiences during the First World War; each as fascinatingly unique as the next. Many books contain references to a “French Village” or name specific battlefield destinations which are off the beaten track as far as battlefield visits may go but Wilfred Cook’s journey saw him see action in places infamous with battlefield tourism; places like Sanctuary Wood and St Yvon and numerous well-known Somme destinations which makes this book ideal as “recommended reading” for people who are about to (or just have) visit(ed) the battlefields for the first time with a tour company or alone. That is not to say that this book is obsolete to those who visit the battlefields regularly because the experiences documented provide a warming and fascination anecdotal insight into the minds of the soldiers who fought at the sites that they will have visited so often. For those who may never set foot on the old front lines, you will find a funny and endearing narrative from the “Little Fusilier” who gained this name from a nurse who was treating and took a particular liking to him. You will find interesting and funny anecdotal stories in those vivid and amazing tales but you also find the warmth extruded by a volunteer soldier in the daily grind of military life; the comradeship; the different characters within his platoon and the relationships that develop in the most testing circumstances. This book is highly recommended as a useful piece of light reading and, although this is not, nor does is profess to be, a new history of the Great War but it would make a great addition to anyone’s bookshelf regardless of depth of necessary knowledge or what the reader wishes to gain from it. What’s more? £1 from every book sold goes to the Royal British Legion. Grab a copy if you can.